This recipe is as close to getting a Turkey Leg at Disneyland without actually going to the park! Instructions: Rinse turkey legs in cold water, pat dry. For brine, combine brine ingredients in large pan. Bring to a boil. Remove from heat, cover, and let cool to room temperature. Pour into container (a large, clean bucket works well) and refrigerate brine until cold (approximately 35-40 degrees F). Place the turkey legs into brine. Let soak four to six hours. Remove legs, rinse well, and discard brine. Dry drumsticks well with paper towels. In small bowl, combine spice rub ingredients with fork til well mixed. Rub onto turkey legs. Let drumsticks sit out for about one hour. 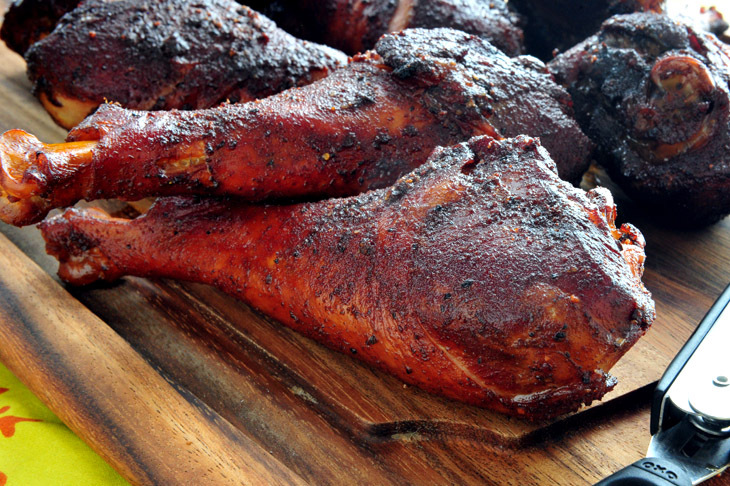 Place turkey legs into smoker at 225 degrees F. A light-flavored wood is best for turkey. Smoke legs for four to six hours, til meat is nearly falling off the bone. Remove legs from smoker, and let rest for half an hour. Devour greedily. Great recipe! Everyone I've made these for have loved them! I always throw more coals on at the end to heat it up and get the skin crisp. Hey, just wanted to say I made your recipe tonight and WOW was that ever good, and so simple! I'll definitely be doing this one again! You don't have to boil the brine but does help to blend and infuse the flavor profile. Also to make the skin crispy, rub / spray olive oil on the turkey legs, this will help seal the moisture w/o drying out the turkey. Radiator Springs Racers Poster for Cars Land! Mater's Junkyard Jamboree Poster for Cars Land! The Road to Cars Land opens Feb. 29th! Disney Mobile Magic App Now on the iPhone! The Incredibles and Pixar Shorts on DVD Giveaway! New Brave poster from Disney/Pixar! MARVEL'S THE AVENGERS - 2 New Images! The Ultimate Star Wars Home Theater! Pirates of The Caribbean Home Theater! Amazing Batman Bat Cave Home Theater!